Soul snack for the monsoon. It’s a monsoon thing. 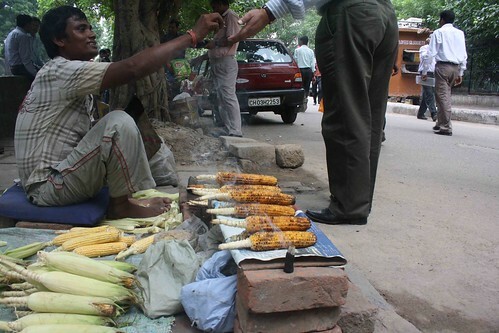 As the air gets humid, the respite is in the dry, crackling, slightly burnt ears of corn, the bhutta in Delhi lingo. Street vendors selling cucumbers in the summer replace their stock with these sticks studded with soft kernels, the colours of which range from pale yellow to a golden shade. A vendor in central Delhi’s Kasturba Gandhi Marg, like others, get the bhuttas each morning from Azadpur Sabzi Mandi, Asia’s largest vegetable wholesale market in north Delhi. He keeps the ear within its light green leaves called the husk. Peeling them reveal strands of silken threads spread out on the bhutta. They stuck in the teeth. That can be avoided. Bhutta eating is no longer a messy job. 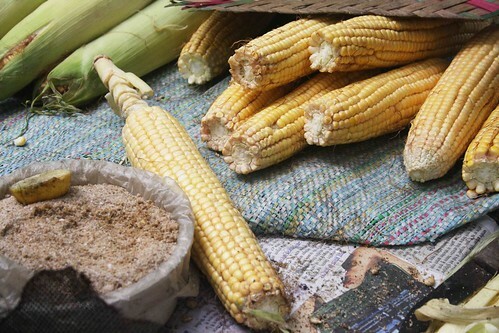 In malls, bright-coloured kiosks sell corn — peeled, picked, steamed, seasoned and buttered — in paper mugs. The original edition, however, lies in the streets. The bhaiya has bhuttas on a bed of smouldering coal; a bag of black salt and lemons nearby. He roasts the ear to your requirement: burnt, or only slightly seared to preserve the sweetness of the fresh corn, or moderately done. 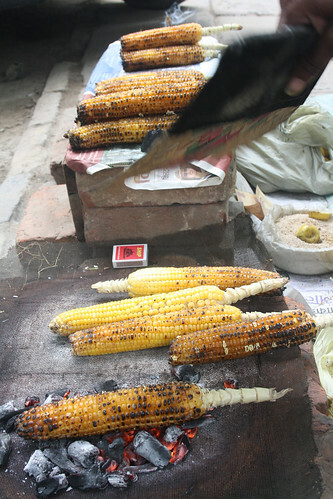 A few like their bhutta boiled, which has a more marked sweetness. The stalls for boiled bhuttas are not many. There is one in Ansari Market in Daryaganj, another in Vijay Nagar in north Delhi, and a few in Lajpat Nagar Central Market, among other places. To check for a bhutta’s sweetness, poke the kernel with your nail. If it presses easily, get it roasted. A true aficionado eats it like a carnivore. The teeth gnaw into the browned stem, which is smeared with salt and lemon (optional), and dig ruthlessly into the kernels. They pop and the sweet juice fills the mouth. The sensation is delicious and fulfilling, rare for something so healthy and inexpensive. It’s the ideal soul food for a bulgy Delhi belly. 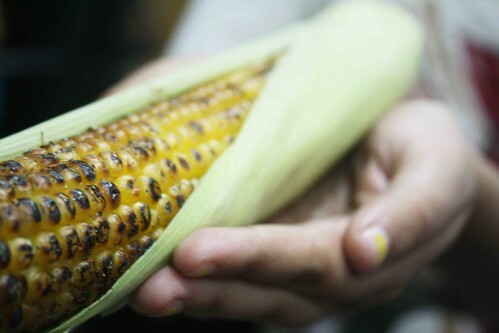 What i love is the aroma of the roasted bhutta and the lemon juice rubbed on it. It never fails to evoke images of childhood in my mind. Bhuttas are so nice and healthy. 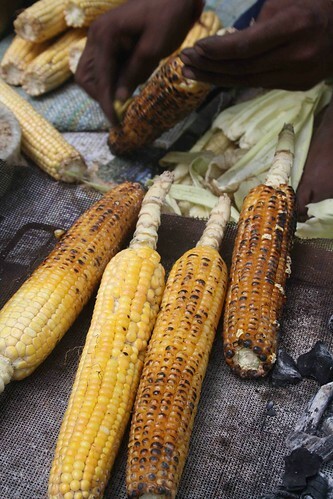 One may not fret over how fatty it is and instead just chomp away at those juicy kernels. 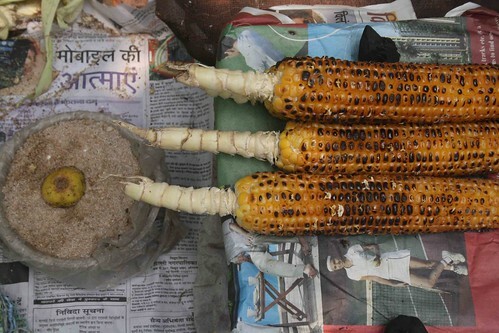 Yeah, and i also like noticing the multifarious styles in which the bhutta is roasted. Some people roast it on open embers. Some vendors choose to roast it on a small earthen kiln they carry around. These produce the best bhuttas. Yet others may use a tin/metal cannister fashioned into a little stove. 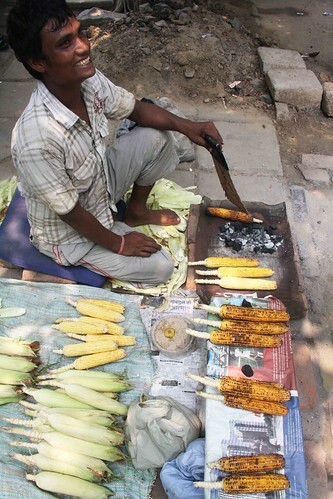 Most vendors in western UP use the earthen kiln method. Also, a part of Calcutta streets. When I was a kid, I used to love gnawing the ear (I know that soumds creepy), and one was never enough. I agree the mall stuff is nothing compared to the streets. 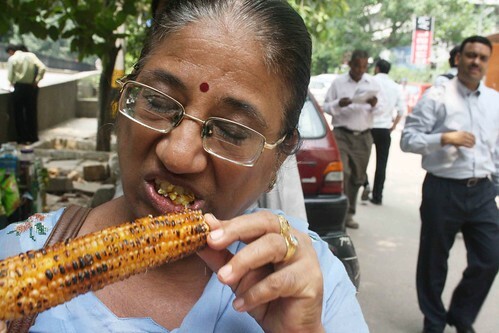 Alas, at my age I can only envy the young folks going at the delicious bhutta. yummmmmyyyyyy bhutta with that masala look it started watering in my mouth nothing can b compared to this no pizza no any italian stuff…………….. I don’t know if anyone else noticed – Mobile Ki Aatmayein! Spooky stuff indeed.